Pioneering sound sharing Web shop Sounddogs have quietly updated both of their two apps: the Absentia dialogue noise reduction tool, and their sound browsing desktop app. What’s new? Let’s look at both apps to see what’s changed and how this affects sound editors and field recordists. 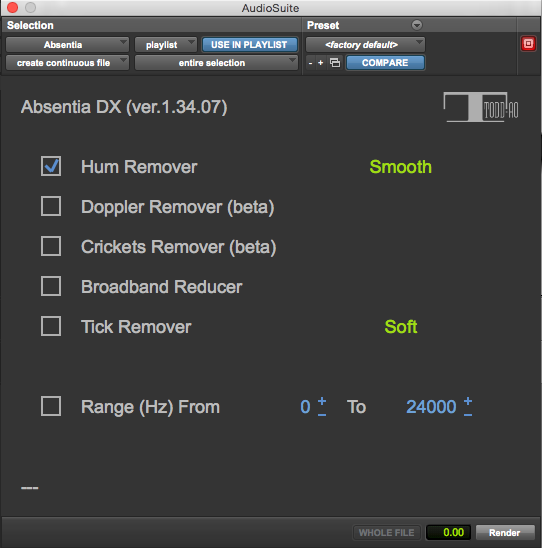 Absentia DX was designed by Sounddogs.com founder Rob Nokes as way to help streamline dialogue cleaning for the Hollywood shows supervises. 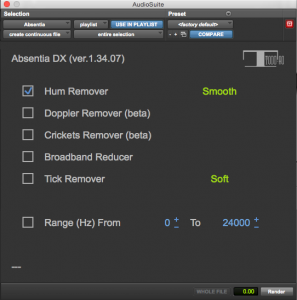 Released in 2017, the app featured hum removal, broadband noise reduction, and tick reduction. An article here on the blog took a first look at the app as well as an usual twist: could the economically priced app help clean field recordings, too? Later that year, Absentia added doppler engine reduction and cricket reduction. That’s an impressive growth of features in the first year of the software’s release. I checked in with the Sounddogs team to learn what they’ve been up to since then. Notably, the Cinema Audio Society (CAS) nominated Absentia for the Outstanding Product – Post Production award. Absentia’s tools aren’t limited to improving dialogue. So, I was also glad to learn that the team are focusing on sound effects cleaning, too. Sounddogs are experimenting with processing field recordings in a number of ways. This video gives a short example of its hum removal capabilities. The app now includes a sonogram. This creates a before/after visual comparison of processing work. It is now possible to specify frequencies when processing. For instance, it is possible to affect frequencies just between 5 and 10 kHz, and leave the rest of the spectrum untouched. Absentia has also changed its pricing structure. It now costs $49 for the original purchase and unlimited updates for one year. Thereafter, an additional year of updates is $20. There’s no obligation to pay for the additional updates. If you choose not to upgrade, you still receive a perpetual license to the latest version from the upgrade year you paid for. The sonogram will add a sound player to compare processing differences. The Sounddogs.com website offers hundreds of thousands of individual sound fx and music clip available for instant download. Just recently they began offering their sound library in a new way: with a desktop app. The Sounddogs desktop app is free to download. It allows anyone to add their own sound libraries, search them, and transfer them to editing apps. It also allows browsing of the entire online Sounddogs library. They also added a new, valuable feature: all subscribers are able to access high-resolution previews as well. 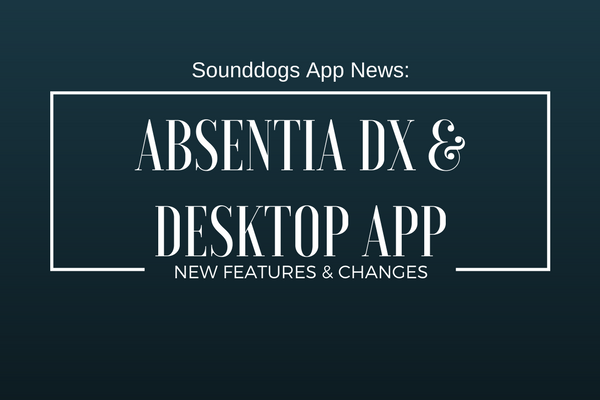 Check out Absentia DX and the Sounddogs Desktop App.